Malaysian prosecutors have charged former prime minister Najib Razak with 21 counts of money laundering and four counts of abuse of power linked to the alleged looting of state fund 1MDB. The raft of charges filed Thursday accused Najib of receiving vast amounts of money in a complex series of transactions. 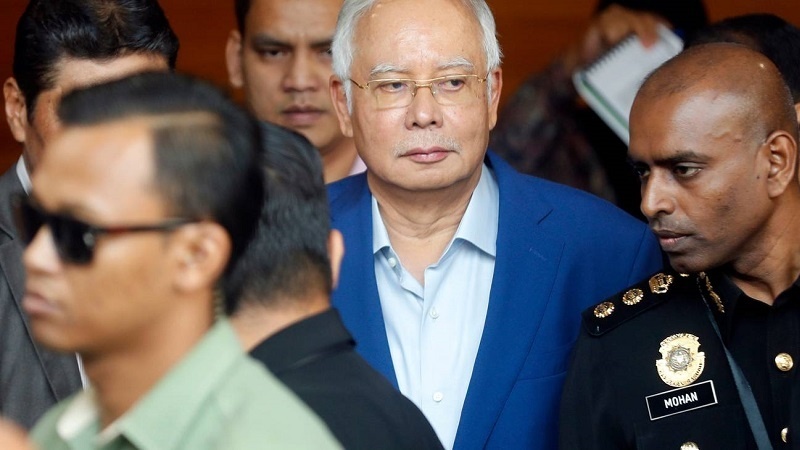 Prosecutors said Najib used his position as prime minister, finance minister and chairman of 1MDB to obtain funds totaling about 2.3 billion ringgit ($556.23 million) between 2011 and 2014. The money-laundering charges describe how Najib received 2.1 billion ringgit from Tanore Finance Corp, which US authorities have said was used to siphon money from 1MDB. Lead prosecutor Gopal Sri Ram said it was a matter of “national disgrace” for a head of state to be facing such charges. Najib was arrested Wednesday by anti-graft authorities in connection with the 1MDB financial scandal . Authorities earlier said Najib was being held at the anti-graft agency’s headquarters and would be transferred to a court. After being charged Thursday, Najib pleaded not guilty to all counts in a string of charges he has faced over misuse of the fund. For each count of abuse of power, Najib faces up to 20 years in prison and for each count of money laundering, he faces up to five years. Najib, whose shock election defeat in May ended his coalition’s six-decade stranglehold on power in Malaysia, was accused of abusing his position to receive funds totaling 555 million between 2011 and 2014. The suspicious transfers to his accounts were a key chapter in the scandal, and Najib has previously insisted they were a donation from the Saudi royal family — an explanation that was widely derided. Several million dollars in 1MDB funds are said to have gone into Najib’s personal bank account, making the corruption scandal the biggest in the country’s history. Najib and his luxury-loving wife Rosmah Mansor have come under intense scrutiny since May, when he was ousted from office in elections and his 93-year-old former mentor, Mahathir Mohamad, was elected prime minister.